Mappe-Monde ou Description du Globe Terrestre, Assujettie aux Observations Astronomiques. A beautiful and impressive map of the world drawn by Jean Janvier in 1782. Depicts the entire world on a double hemisphere projection. North America appears with a fair approximation of accuracy though the western and northwestern regions remain either blank or speculative. Alaska is entirely absent, but the Aleutian archipelago does appear in an embryonic form according to earlier Russian explorations. By contrast the northeast parts of Asia, which had recently been explored by Vitus Bering and Tschirikow, are depicted with a fair approximation of accuracy. Both the apocryphal Terre de Gama and Terre de la Company appear just northeast of Yedso (Hokkaido). Often called de Gamma Land or Gama, these islands were supposedly discovered in the 17th century by a mysterious figure known as Jean de Gama. Various subsequent navigators claim to have seen this land, but it was left to Bering to finally debunk the myth. In 1729, he sailed for three days looking for Juan de Gamaland but never found it. Though it may be a little more than a mis-mapping of Hokkaido or the Japanese Kuriles, Gama or Compagnie remained on maps for about 50 years following Bering's voyages until the explorations of Cook confirmed the Bering findings. South of the equator the shores of Australia or New Holland are speculatively mapped with a dotted line defining the southern edge of the continent. Van Diemen's Land or Tasmania is attached to the mainland. Polynesia is mapped with numerous islands named, but few are the correct size or in the correct place. Hawaii, which had just been discovered by Cook, here makes its first appearance. What is shown is 'Terre de Davis' roughly where easter Island is today. Terre de Davis or Davis' Land was supposedly discovered in 1688 by an english navigator of the same name. Many historians argue whether or not Davis Land was actually easter Island, but it does seem likely. In South America many of the speculative geographic elements common to earlier maps of the regions, such as el Dorado and Lake Parima, are absent though the Lago de Xarayes does remain. The Xarayes, a corruption of 'Xaraies' meaning 'Masters of the River,' were an indigenous people occupying what are today parts of Brazil's Matte Grosso and the Pantanal. When Spanish and Portuguese explorers first navigated up the Paraguay River, as always in search of el Dorado, they encountered the vast Pantanal flood plain at the height of its annual inundation. Understandably misinterpreting the flood plain as a gigantic inland sea, they named it after the local inhabitants, the Xaraies. The Laguna de los Xarayes almost immediately began to appear on early maps of the region and, at the same time, took on a legendary aspect as the gateway to the Amazon and the kingdom of el Dorado. Africa, as usual, is mapped accurately along the coasts and speculatively in the interior. While numerous tribes, kingdoms, and desert caravan routes are noted, most of the interior is conjectural. The Nile follows the two lake pattern developed in the 15th century on Ptolemaic maps. The gold mining region near the Kingdom of Monomotapa are labeled. South Africa is noted as the home of the Cafrerie and Hottentots. The great southern content, a kind of speculative proto-Antarctica common to many early maps, is entirely absent, though several Antarctic islands, including the Cap de la Circoncision (Bouvet's Island) and Lozier's B. de L'Oiseau are noted. Both hemispheres are crowned with an elaborate decorative cartouche in the late baroque style. Drawn by Janvier as plate no. 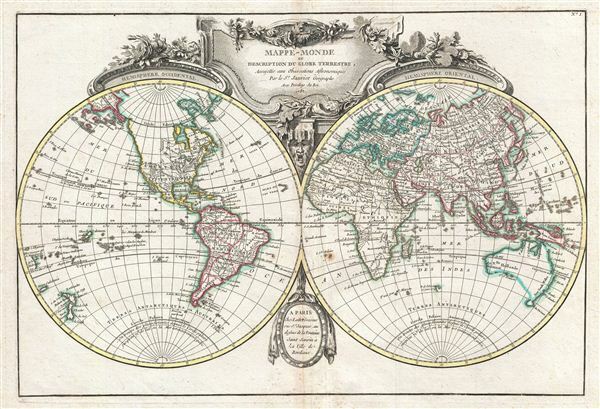 1 in Jean Lattre's 1783 Atlas Moderne. Very good condition. Original centerfold. Blank on verso. Wide margins all around. Rumsey 2612.003. Phillips (Atlases) 664. Perry, Thomas Melville and Prescott, Dorothy F., A guide to Maps of Australia in Books Published 1780 - 1830: An Annotated Cartobibliography, 1762.01. National Maritime Museum, 215. British Library, World, col. 384-385 (1762-1785 editions). National Library of Australia, MAP RM 3232.